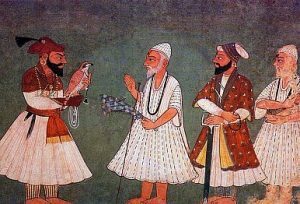 The relationship between Sufism and Sikhism dates back to the time of Guru Nanak (1469-1539), who led a modest life of profound, spiritual devotion, focused on building bridges of love, tolerance, co-existence, and harmony among peoples of diverse faiths and socio-economic status. So immersed in piety and teaching his disciples to live spiritually, honestly, and harmoniously was the Guru, that many of his Muslim contemporaries, especially Sufis, called him a true Muslim. Guru Nanak traveled extensively – including to Mecca for Haj, different provinces of Afghanistan, and Baghdad – in search of divine knowledge and mystic scholarship. This gave him more exposure to Islam and its various mystic schools of thought than to any other religion. And, of course, for 64 long years, one of Guru Nanak’s closest companions and servants was Mardanda, who remained a Muslim until he died. According to the custodian of the shrine of Miyan Mir in Lahore, the descendants of Mardana still live there, and they refer to themselves as Sikh-Muslims. Upon his death, Guru Nanak left behind a large number of Hindu and Muslim disciples, each side claiming him as theirs, for he had lived with them so harmoniously and treated them so equally, so respectfully, and so sincerely that neither side was willing to give up his body to the other. Today, the shrine of Guru Nanak is visited not only by Sikhs but also by Hindus and Muslims, each seeking his blessings in their distinct ways. It was in this mutually reinforcing spiritual relationship that evolved between Sufism and Sikhism that Guru Arjan Dev invited Miyan Mir, a leading Sufi of his time and Pir of the Sufism’s Qaderi Order, to lay the foundation stone of the Golden Temple in Amritsar, Punjab. Indeed, the commonality of the values and principles, which the Gurus and Sufis had been teaching their followers, was so deeply focused on humanism that Guru Granth (the central religious text of Sikhism) includes 112 couplets and four hymns by Khwaja Fariduddin Ganjshakar (1173-1266), a prominent Sufi of the Chishti Order, who lived in Punjab. This underscores the deep relationship between Sufism and Sikhism, and the influence they had on one another. Since the emergence of Sikhism in the 15th century, the differences between the Sikh and Muslim communities have been traced to realpolitik. These differences have rarely emanated from the shared path, which the Sufis and the Gurus followed to reach truth by serving the vicegerents of God on this earth, while inviting them to love, tolerate, and help one another. Afghanistan is the birthplace of many great Sufis of the subcontinent, including the sultan-ul hind: Khwaja Moinuddin Chishti. He was born in Chisht, Herat, sometime in 1141, and eventually settled down in Ajmer, following a dream in which Prophet Mohammed (PBUH) blessed him to do so. To restore this spiritual connection, Afghanistan has recently proposed to establish a sister-city relationship between Chisht of Herat and Ajmer of Rajasthan, both to honor the legacy and contributions of the great Sufi and to further strengthen cultural ties between Afghanistan and India, based on the two countries’ shared past and intertwined destiny. To implement these universally good deeds, the followers of Chishti and other Orders of Sufism set up khanaqas, community centers with feeding and lodging facilities, which were built in rural areas throughout India. The Chishti Order khanaqas welcomed anyone, regardless of faith, race, or caste, and offered them food and shelter, spiritual guidance, psychological support, and counseling. By creating egalitarian communities within a stratified society, the Sufis successfully spread their teachings of love, spirituality and harmony. Indeed, it was this example of Sufi brotherhood and equity that drew people to Islam. To restore peace and harmony in South Asia today, we do not need to look much farther afield. We should simply revisit the basic precepts of Sufism and Sikhism. In a fast shrinking, interdependent world, nations should tear down walls of hatred, hostility, and self-defeating, zero-sum designs to undermine each other. These artificial human obstacles to their collective progress should be replaced by honest, results-oriented efforts to achieve regional integration for peace and prosperity for all. That is what the great Sufis and Gurus of Central Asia and South Asia preached and promoted, so that human tragedy was replaced by human harmony through universal human service and fraternity under one beneficent, merciful God and its many different, beautiful manifestations. In effect, Ghani maintained that so long as the South Asian nations remained locked up in a zero-sum mindset, undermining one another, they would struggle to develop and advance together on a sustainable basis. The president noted that to change the status quo was “the test of leadership.” For inclusive, transformational leadership, which South Asia direly lacks, we need to draw inspiration from the kind of leadership that Guru Nanak exhibited during his lifetime. As noted, Guru Nanak led his Hindu and Muslim followers by example, so much so that he had erased from his followers’ minds any differences among their ethnicity, faith and caste. In other words, he unified them around an ethos that promoted the general wellbeing of all people. Afghanistan, where many of this region’s Sufis, Gurus, poets, and scholars were born and where they made remarkable contributions to the region’s shared, rich civilization, has been a target of the so-called Muslims that daily terrorize innocent Afghans, burn down their schools and madaares, and increasingly carry out suicide terrorist attacks inside their mosques where the innocent and the poor pray and worship God. They ruthlessly kill civilians – men, women, and children – in the name of a religion of peace, tolerance, harmony, and co-existence, whose true message the great Sufis of Afghanistan – like Khwaja Moinuddin Chishti – spread throughout South Asia. Indeed, the Sufis’ was the real jihad, the greater jihad, whose message of universal brotherhood naturally resonated with and attracted believers of different faiths and social castes. Theirs was the straight path, the path of Prophet Mohammed (PBUH), from which today’s killers of innocent Muslims and non-Muslims have long and far deviated, increasingly serving the political, short-sighted interests of realist states in the international system. Because of this deviation from the noble teachings and traditions of Islam – whose image they have harmed terribly – the terrorists who often kill and destroy, in the guise of jihad, will not succeed in their worldly designs, even at the cost of innocent human lives. Certainly Afghanistan didn’t succumb to their brutal, inhumane atrocities against its people during the 1990s; rather, the brutality which eventually spelled their own downfall. Nor would the country’s courageous people ever cease their greater jihad to secure and rebuild their country, in partnership with the international community. M. Ashraf Haidari is the deputy chief of mission of the Afghan Embassy in India. 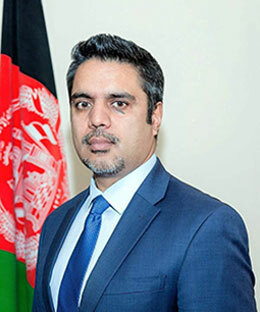 He formerly served as Afghanistan’s deputy assistant national security adviser, as well as chargé d’affaires and deputy chief of mission of the Afghan Embassy in the United States.